Wisconsin Track Coaches Association All-State Team. 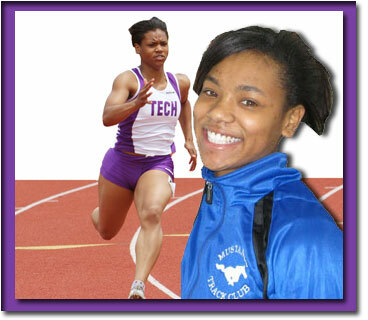 2010 WISTCA Athlete of the Year Dezerea Bryant a junior from D1 Milwaukee Bradley Technical High School won three Gold Medals at the 2010 WIAA State Track and Field Meet. In winning the 100m and 200m dash events she set two All-Division records. In the finals of the 100m dash event Bryant recorded a 11.50 to smash the record [11.76] she and Tasha Allen [Milwaukee North] had set in the preliminaries of the 2009 State Meet. In the 4x1 relay Bryant was the anchor bringing the Trojans from behind to a first place finish. In the preliminaries of the D1 200m dash Bryant had broken Chidera Obasih's [Brookfield Central] record of 23.85 [set in the prelims of the 2009 State Meet] by posting a 23.58. In the finals during a driving rain storm Bryant was clocked in 23.37 to set a D1 and an All-Division record for the 200m dash. Bryant has helped Coach Ken Williams Bradley Technical team win two consecutive D1 State Championships. Instead of resting on her accomplishments Bryant has continued to work hard during the summer of 2010. Running for the Milwaukee Mustangs track and field club Bryant posted a 11.29 at the USA TF Region 8 Meet. Bryant ran on the USA Team at the IAAF World Junior Championships held in Moncton [Canada] July 27- August 1. She ran the third leg on the 4x1 relay team. The relay team finished as a World Champion at the IAAF World Junior Championships. The 4x1 relay team consisted of Stormy Kendrick [Clemson University], Takela Pinckney [Lousiana State University], Dezerea Bryant [Milwaukee Bradley Technical senior, Class of 2011], and Ashley Collier [Texas A & M University]. 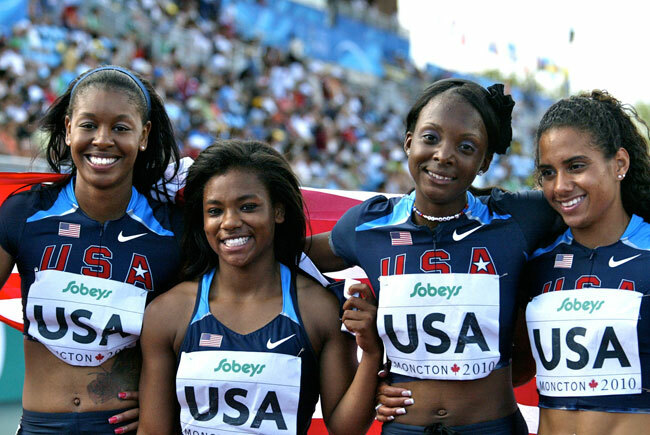 The quartet posted the third fastest time by a USA National Junior 4x1 relay team by recording a 43.44 in the finals. This was the second fastest time ever in a World Junior final. 100 Meter Dash: 1. Dezerea Bryant (Milwaukee Bradley Technical), 11.50; 2. Chidera Obasih (Brookfield Central), 11.81; 3. Tahje Whittley (Milwaukee Bradley Technical), 12.00; 4. Danielle Barbian (Hamilton), 12.11; 5. Eileen Gehring (Madison Edgewood), 12.11; 6. Felicia Carlson (Beloit Memorial), 12.12. 200 Meter Dash: 1. Dezerea Bryant (Milwaukee Bradley Technical, 23.37; 2. Elexis Fuller-Stewart (Milwaukee Bradley Technical), 24.33; 3. Chidera Obasih (Brookfield Central), 24.34; 4. Kat Keller (New Richmond), 24.92; 5. Heather Bong (Arrowhead), 24.95; 6. Deysha Smith-Jenkins (Dominican), 25.10. 400 Meter Dash: 1. Chidera Obasih (Brookfield Central), 55.18; 2. Tahje Whittley (Milwaukee Bradley Technical, 55.51; 3. Bria Halama (Independence/Gilmanton, 56.56; 4. Gretchen Homan Central Catholic), 56.58; 5. Eileen Gehring (Madison Edgewood), 56.72; 6. Kate Hein (Green Bay Green Bay Notre Dame), 57.09. 800 Meter Run: 1. Alaina Murphy (Seymour), 2:14.66; 2. Alison Parker (Neenah), 2:14.67; 3. Kim Hennings (Kiel), 2:15.54; 4. Lizzie Wendt (Germantown), 2:16.41; 5. Madeline Haupert (La Crosse Aquinas), 2:16.91; 6. Tricia Serres, (Platteville), 2:17.01. 1600 Meter Run: 1. Gabby Levac (Arrowhead), 4:57.77; 2. Jenna McMiller (Waukesha North), 5:00.67; 3. Haley Johnson, (Plymouth), 5:01.23; 4. Whitney Schumacher (Kimberly), 5:01.85; 5. Allie Woodward (Green Bay Notre Dame), 5:02.05; 6. Hannah Trasser (Brookfield Central), 5:03.87. 3200 Meter Run: 1. Molly Seidel, (University Lake School) 10:39.88; 2. Gabby Levac (Arrowhead), 10:47.22; 3. Ashley Eckhoff (Wausau East), 10:48.06; 4. Jenna McMiller (Waukesha N), 10:53.81; 5. Allie Woodward (Green Bay Notre Dame), 10:55.51; 6. Lindsay Fons (Franklin), 11:00.20. 100 Meter Hurdles: 1. Marissa Savitch (Homestead), 14.52; 2. Sherice Hewett (Milwaukee Vincent), 14.80 ; 3. Madeline Emme (Watertown), 14.99; 4. Amelia Campbell (Sturgeon Bay), 15.26; 5. Asia Cheeks (Brown Deer), 15.29; 6. Jessica Will (Omro), 15.30. 300 Meter Hurdles: 1. Michelle Garner (Greenfield), 43.77; 2. Maya Carter (Racine Case), 43.81; 3. Erin McCauley (Middleton), 44.59; 4. Jessica Will (Omro), 44.92; 5. Teresa Rock (Newman), 45.16; 6. Jenna Ciszewski (Kenosha Tremper), 45.39. 4x100 Meter Relay: 1. Milwaukee Bradley Technical, 47.95 (Angelina Howard, Derricka Wesley, Amber Coggs, Dezerea Bryant); 2. Hamilton, 48.04 (Toney Lock, Brooke Patterson, Ashley Holicek, Danielle Barbian); 3. Arrowhead, 48.53 (Elizabeth Duchow, Rachel Uebersohn, Amanda Shober, Heather Bong); 4. Waukesha West, 48.88 (Emily Duffy, Katie Corrao, Halley Ahler, Hannah Rhode); 5. Milwaukee Riverside University, 49.35 (Tori LeFlore, Jessica Franklin, Dalisha Edmond, Demetra Camble); 6. Milwaukee. Lutheran, 49.47 (Alexandria Schad, Chelsea Jordan, Charese Hampton, Raynna Thompson). 4x200 Meter Relay: 1. Hamilton, 1:40.86 (Ellen Buckley, Jess Rupnow, Brooke Patterson, Danielle Barbian); 2. Milwaukee Bradley Technical, 1:41.00; (Angelina Howard, Derricka Wesley, Tiffany Matthews, Elexis Fuller-Stewart); 3. Arrowhead, 1:42.03 (Elizabeth Duchow, Rachel Uebersohn, Amanda Shober, Heather Bong); 4. Waukesha West, 1:42.21 (Emily Duffy, Katie Corrao, Halley Ahler, Hannah Rhode); 5. Nicolet, 1:43.00 (Ashley Jones, Surya Chionesu, Ashley Green, Roni Thompson); 6. Milwaukee. Lutheran, 1:43.02 (Tierra Brown, Alexandria Schad, Chelsea Jordan, Raynna Thompson). 4x400 Meter Relay: 1. Waukesha West, 3:57.31 (Emily Duffy, Halley Ahler, Kristin Heckel, Lauren Grant); 2. East Troy, 3:58.52 (Alee Schahczinski, Meghan Valentine, Jasmine Haines, Tia Nowak); 3. Milwaukee. Bradley Technical, 3:58.99 (Elexis Fuller-Stewart, Tahje Whittley, Dinah Watts, Tiffany Matthews); 4. La Crosse Central, 3:59.19 (Jourdan Stacey, Abby Knutson, Tabby Roh, Alex Klos); 5. Kiel, 3:59.60 (Kristin Mathes, Maxine Becker, Mikayla Preissner, Kim Hennings); 6. Platteville, 4:00.44 (Tricia Serres, Julia Lawinger, Laura Donovan, Emilie Kay). 4x800 Meter Relay: 1. Onalaska, 9:12.28 (Rachel Lukas, Maddie Johnson, Maddie Hibshman, Jamie Burr); 2. Arrowhead, 9:16.89 (Tayler McCormack, Taylor McDowell, Andie Zeman, Gabby Levac); 3. Homestead, 9:19.04 (Caity Bobber, Lauren Holtz, Sarah Miller, Keali Bjork); 4. Neenah, 9:24.09 (Lindsay Turchan, Lydia Fahrenkrug, Claire Knaus, Alison Parker); 5. Germantown, 9:24.12 (Andrea Sielicki, Mackenzie Erdmann, Caitlin Dillon, Lizzie Wendt); 6. La Crosse Central, 9:27.76 (Amanda Tomten, Kayla Guepfer, Morgan Sanger, Abby Knutson). Pole Vault: 1. Courtney Walden (Oconomowoc), 11-06.00; 2. Faryn Wirkus (Edgar), 11-06.00; 3. Alex Flucke (Ashwaubenon), 11-00.00; 3. Cami Gilson (Arrowhead), 11-00.00; 3. Alayna Muldoon (New Holstein), 11-00.00 ; 6. Rychia Bosman (Gibraltar), 10-06.00; 6. Megan Courtney (Stevens Point), 10-06.00; 6. Alex Douglas (Madison East), 10-06.00; 6. Melanie Pilon, (Waukesha South), 10-06.00; 6. Beth Rieth (Oconto Falls), 10-06.00; 6. Leanna Rose (D C Everest), 10-06.00; 6. Camille Schwartz (Whitefish Bay), 10-06.00; 6. Stefanie Weber (Burlington), 10-06.00; 6. Dani Vetesnik (Richland Center), 10-06.00; 6. Jessica Wiegert (De Pere), 10-06.00. Triple Jump: 1. Laura McGinnis (Middleton), 38-08.75; 2. Sherice Hewett (Milwaukee Vincent), 37-04.75; 3. Raquel Ebbe (Nekoosa), 37-03.50; 4. Bria Halama (Independence/Gilmanton), 37-02.00; 5. Emily Haines (Tomah), 37-01.50; 6. Mikayla Robertson (Menomonee Falls), 36-11.25. Shot Put: 1. Jessica Maroszek (Seymour), 49-04.25; 2. Angela Boushea (Monona Grove), 47-04.25; 3. Tina DeLakis (Eau Claire Memorial), 46-00.00; 4. Marissa Theys (Green Bay East), 43-01.00; 5. Alissa Rausch (Wausau West), 42-10.00; 6. Paige Garriga (Osceola), 42-02.50. Discus Throw: 1. Jessica Maroszek (Seymour), 157-04; 2. Angela Boushea (Monona Grove), 148-08; 3. Devin Stanford (Milwaukee Lutheran), 139-01; 4. Kathryn Koeck (Winneconne), 133-09; 5. Kailee Kamps (Belmont), 132-07; 6. Catie Zepczyk, (Ashland), 131-09.